Lightly spray a 9x9 square baking pan. You can line it with parchment for easy removal later for cutting, but this is optional. First make the crust. I crushed my cookies in my food processor. I wanted them to be super fine. You can do them any way you like, as long as you end up with 1 1/2 cups finely crushed cookies. Mix the crumbs with the melted butter and sugar and blend well. I do this right in the processor. Pat the crust firmly into the bottom of your pan. To make the filling,, cream the butter and sugars together until well combined. Work out any lumps in the brown sugar as you go. Blend in the rest of the ingredients and mix until everything is well incorporated. Pour the filling over the crust and bake for 15 minutes, then reduce the oven temperature to 325F and open the door until it gets there. Remove from oven and let cool to room temperature, and then refrigerate until completely chilled. 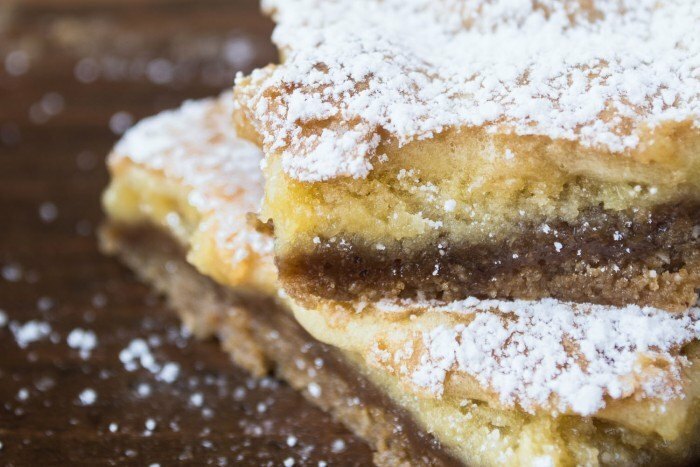 Dust with powdered sugar, slice into small squares and enjoy.